Didier Deschamps opted for a fairly adventurous lineup once more, leaving N’Golo Kante out in favor of an attacking 4-2-3-1. Considering this was a final, this was a bold move by Deschamps, who saw the same decision essentially backfire in the previous game. Portugal coach Fernando Santos named the expected side, lined up in a 4-4-2 diamond. Pepe returned to the starting lineup after recovering from his injury. This was essentially a clash between a well-rounded side with attacking firepower, France, and the defensive unit of the knockout rounds, Portugal. While Portugal did overcome Croatia by stifling their midfield, it isn’t a stretch to suggest that this was the sternest test of Fernando Santos’ side. 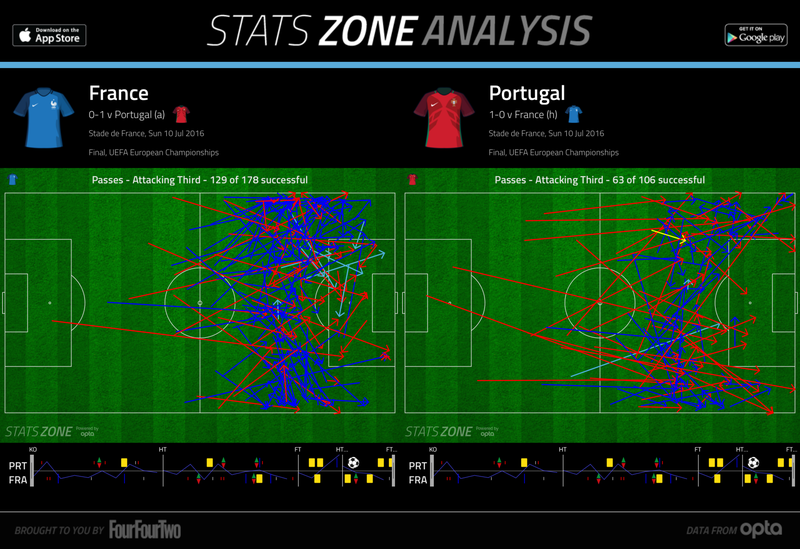 The first half was fairly uninspiring, as Portugal naturally sat back and invited France forward. In attack, Portugal rarely committed more than 4 players forward, ensuring that it became a game of attack against defense. 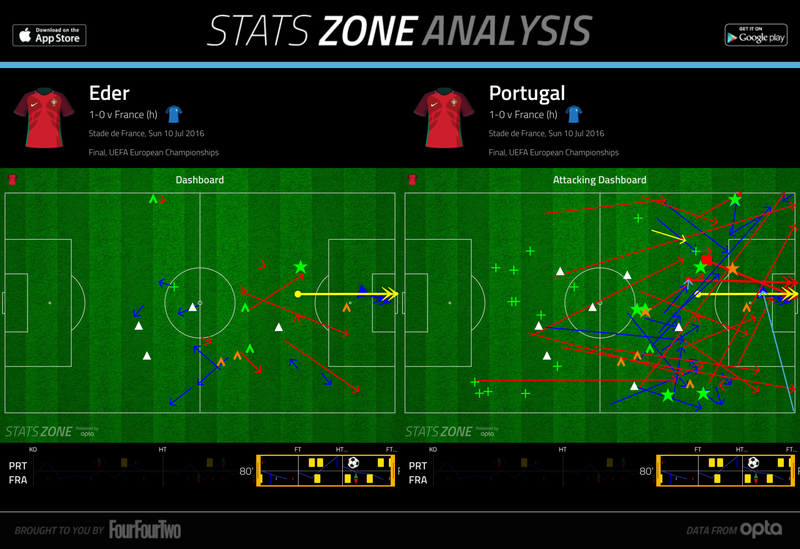 Defensively, Portugal were sound, and successfully stifled France’s attackers. Santos’ physically adept midfield diamond was flexible off the ball; only William Carvalho was given a specific task (marking Antoine Griezmann). The other 3 midfielders would vary their tasks, often taking on Matuidi and Pogba’s runs forward, marking full backs, or tracking infield runs from the French wingers. France have only looked a fluid attacking side once this tournament, in their 5-2 victory over Iceland. The hosts, however, exploited Iceland’s high line and inferior physicality that day, and were unlikely to succeed with such a system in the future. Portugal defended deep and matched France’s athleticism, particularly in midfield, which meant that France couldn’t create chances with combination play. France dominated possession and territory, but just like Germany on Thursday, struggled to make the most of their time in the attacking third. Any chance of Portugal committing players forward was further offset by Cristiano Ronaldo’s injury. The Portuguese came off midway through the first half, and Portugal moved into a permanent 4-5-1, with Nani playing as a lone striker and Ricardo Quaresma occupying the right wing. For all the criticism directed at Cristiano Ronaldo, he has successfully played as an attacking anchor through the middle in the past, despite making his preference for the left wing well known. While they did lose a fantastic attacking player, in terms of this tournament, Portugal lost his ability to hold up play and attract markers. 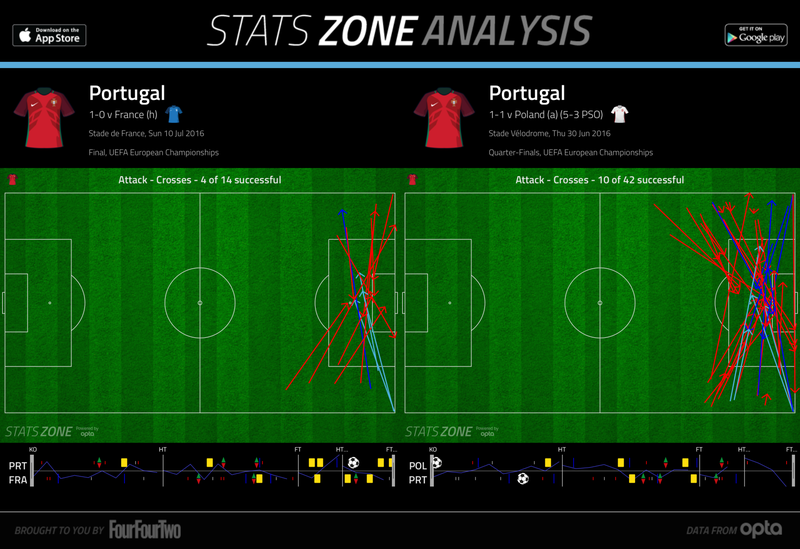 Portugal attempted fewer crosses in this match with no target man to cross to for most of the match. The second half started the way the first half ended, with more French possession, but Portugal seemed to play in a 4-1-4-1 more often than not. The central midfielders looked to press Paul Pogba and Blaise Matuidi and prevent them from quick switches of play. 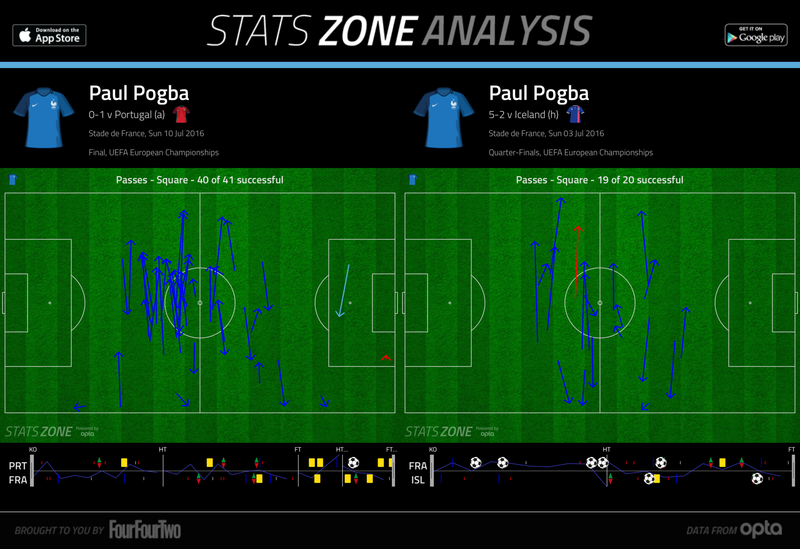 The midfielders also stuck closer to the French wing backs, forcing Pogba into shorter square passes. Despite this, Portugal were also strangely open between the lines at certain times, allowing Antoine Griezmann and co. to receive the ball in central areas. William Carvalho was assigned to man mark Griezmann, but during the first half in particular, the Frenchman roamed the attacking third, perhaps leading to open passing lanes during the second half. An interesting feature of France’s play was their chance creation. 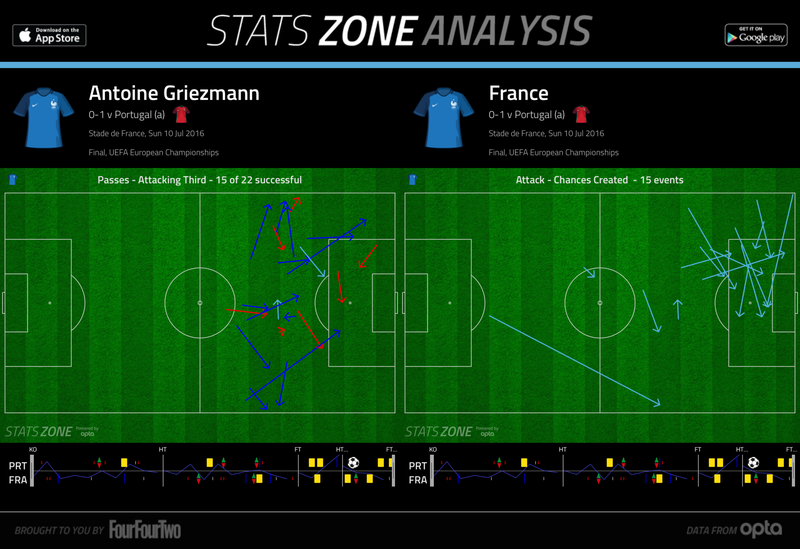 The majority of their chances were created with crosses from the left side of their attack, where Payet, Griezmann and even Sissoko tended to roam. Aerially, Portugal were fantastic on the road to the final, yet here they conceded multiple chances to Antoine Griezmann from crosses. On the other hand, France struggled to create chances of any relevance through combination play. The hosts resorted to crosses and long balls, but until the introduction of Andre Pierre Gignac, were fairly dormant with the ball on the ground. Keeping with the theme of Euro 2016, the game was ultimately defined by the impact of both managers’ substitutions. Each coach’s substitutions affected the game in different ways, and crediting one manager for having a superior impact with the use of his bench would be unfair. Didier Deschamps took some obvious gambles with his substitutions, and had his side taken their chances, they would have paid off. Kingsley Coman for Dimitri Payet comes as no surprise, looking at the latter’s dip as the tournament progressed. Payet provided late goals during the group stages, however, barring a goal against Iceland, saw his form dip during the knockout stages, likely due to fatigue. Coman, on the other hand, was lively, providing 2 key crosses and energy down the left. Similarly, Didier Deschamps nearly introduced a game-winning substitute in Andre-Pierre Gignac, who hit the post minutes before the end of normal time. This was his best contribution, however, and his entrance into the game coincided with Antoine Griezmann’s drop off in form, likely due to the exit of Olivier Giroud, and his ability to occupy multiple center backs. Portugal coach Fernando Santos’ roll of the dice, in sending on Eder, was arguably one of the tactical substitutions of the tournament. Portugal, despite their flexible man-marking system, were struggling to shut down central passing lanes, and also lacked identity going forward due to the absence of Cristiano Ronaldo. Eder’s entrance simplified Portugal’s defensive task, and gave all their creative midfielders a target for crosses. He also was better at hold up play than Nani. Portugal continued to play in a 4-5-1, but with 2 recognized wide midfielders (Joao Mario, Nani), rather than 1. Both of the wide men tracked their full backs, while William Carvalho stayed in proximity to the tiring Griezmann. The remaining midfielders dealt with Paul Pogba and Blaise Matuidi. Eder gave Portugal more time on the ball, provided a target for crosses, and seemingly improved their defensive system. Furthermore, from an unlikely angle (and distance), the Swansea man scored the winning goal of Euro 2016. Both sides hit the post and continued to fashion chances, but it was Eder who was the goal-scoring substitute. The game came down to an unlikely goal from the unlikeliest of sources, but both sides created enough chances to win the game. On a better day, Antoine Griezmann would have put away his chances, and Cristiano Ronaldo wouldn’t get injured. It has been an interesting tournament for the Real Madrid star. He has been heavily criticized, carried his team into the knockouts, scored an important goal, yet he missed most of the final. But even his detractors cannot discredit his leadership. France, despite reaching the final, were far from a side on Germany’s level, and although they reached and put in a decent performance in the final, Didier Deschamps underwhelmed. France lacked a true midfield playmaker, and their lack of cohesion in the attacking third is something to ponder. Portugal’s victory symbolizes the nature of the tournament as a whole. Defensive, tactical sides beat those who attempted to dominate the ball at Euro 2016, although the only team that successfully implemented a possession style was Germany. The World Champions, however, were victims of their own individual errors, and were thus beaten to the title by a truly resilient, opportunistic Portugal side. Not the best Portugal side, but one with the ingredients to win a modern international tournament: a strong defense and team ethic, a superstar, and an able bench.